Journalists from major Canadian and international media outlets will be descending on the Prospectors and Developers Association of Canada’s (PDAC) convention in Toronto March 4-7. Some of these outlets, like BNN and the Globe and Mail, are even official media partners. We’re tired of seeing PDAC coverage that repeats industry PR without mentioning the experiences of impacted communities. At PDAC 2018 we’ll be sharing a brief with journalists (see below) that summarizes some of the most egregious human rights abuses, environmental destruction and economic damage done by major convention sponsors, including Barrick Gold, Goldcorp and Rio Tinto, as well as other Canadian mining companies like HudBay Minerals and Nevsun. Media outlets covering PDAC need to tell these stories too! What’s Hidden at the PDAC Convention? The “Oscars” of the global mining industry – the Prospectors and Developers Association of Canada’s (PDAC) annual convention – is happening in Toronto from March 4th-7th. The PDAC convention is the world’s largest mineral industry gathering, bringing together geologists, mining engineers, CEOs, financiers, and government representatives. This industry gathers yearly to make deals and give out awards without the presence or input of most impacted communities and without mention of the numerous harms perpetuated by mining corporations. Responsible news outlets and journalists should not be replicating industry press releases without acknowledging these well-documented abuses. For example, PDAC’s 2018 Environmental and Social Responsibility Award is going to Golden Star Resources, a company linked to the criminalization of artisanal miners, the shooting of 7 people, the intimidation of community members, and cyanide spills in Ghana., ,  The Canadian mining industry as a whole has a reputation for bad behaviour; a leaked report commissioned by PDAC found that Canadian companies have played a large role in resource conflicts globally. The PDAC convention is promoted as a space to identify and celebrate best practices, but this rhetoric is largely misleading given the industry’s troubling track record. Many companies present in the Investors Exchange have been involved in extensive environmental devastation. Barrick Gold and Goldcorp were featured speakers on a water management panel as part of 2017’s Corporate Social Responsibility (CSR) Series. However, the history of water contamination by these Platinum Sponsors tells a different story. In January 2018, the Chilean government ordered the permanent closure of surface facilities at Barrick Gold’s Pascua Lama mine due to severe water concerns, including damage to glaciers., Barrick Gold also faced fines in Argentina over three cyanide spills in 18 months, including a 2015 spill of 1 million litres into waterways used for drinking water. 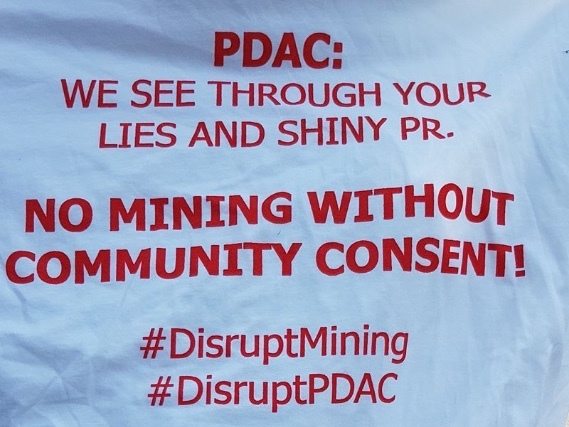 While PDAC’s CSR event series “aims to facilitate multi-stakeholder dialogue and peer learning on key issues related to responsible exploration and mining,” these conversations clearly have not led to accountability in the mining industry. Prominent PDAC members have been accused of and even sued for their role in serious human rights violations including murder, sexual assault and exploitative labour practices. The mining industry regularly touts the economic benefits of mining, yet many companies avoid paying their fair share and some have even launched litigation against countries for denying them permits. Turquoise Hill Resources, the Canadian subsidiary of Rio Tinto, allegedly used tax havens and financial schemes to avoid paying $559 million USD in Canadian taxes and $230 million USD to the Mongolian government. Similarly, Eldorado Gold allegedly avoided paying $2.3 million owed to cash-strapped Greece. OceanaGold, a 2018 convention sponsor, sued El Salvador in 2009 for $250 million after the government would not issue a mining permit. In 2016, an investment dispute tribunal dismissed OceanaGold’s case and ordered the company to pay El Salvador $8 million. Other Canadian companies, such as Infinito Gold, continue to sue governments, challenging their democratic processes and causing financial strain. o Question the claims made by PDAC and its representatives during the convention.